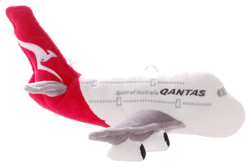 What started as a mere observation regarding the obvious cuddliness of the Airbus A380 resulted in the this tweet from @johncarneyau, the tweet below from @DrRachie, a Google search and the above plushie! I'd had a pretty difficult day, but this made me grin from ear to ear… in public! :D Who says Twitter is nothing but people complaining? Older post → Facebook saved Twitter $1 billion?